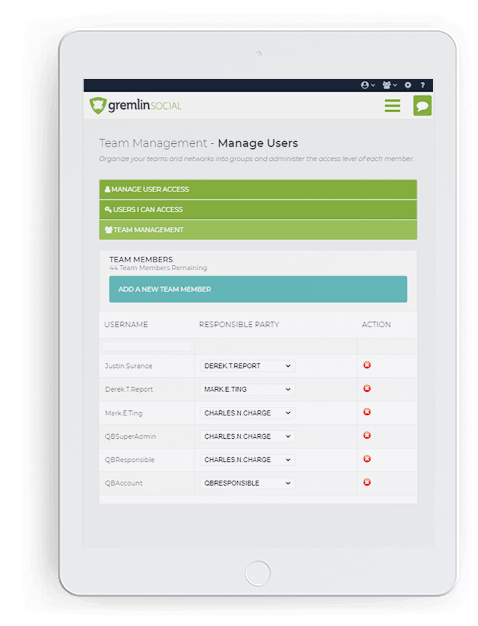 Team management has never been easier. Reduce risk with Gremlin Social by controlling access to social media accounts and moderating post content before it's published. Grant access to multiple social media accounts within Gremlin Social without revealing passwords. Eliminate lag-time and confusion by assigning messages to appropriate team members. Organize departments into multiple groups and allow access to several social network accounts without sharing passwords. Get peace of mind knowing you can moderate post content before publication. Set up approval processes that empower management or your compliance team to moderate content before it is published. Posts do not get sent until your approval process is fully executed.